A girl of 15 years old came with arteritis nodosa. She has pains in her joints, hands, feet and knees; it is a stabbing pain as if from knives. The pain is worse from stretching her legs. She also has blue spots on her legs and knees. The veins on the back of her hands are inflamed and very painful, worse form the slightest touch. She can scream from the pain. High fever accompanies the inflammations sometimes. She has it for a few years. The disease started with an ulcer in her mouth. Later she developed a nodus on her head. Once she could not walk anymore from the pains. The complaints are always worse at the end of the afternoon around 5 pm and in springtime, April. She is treated with Ascal, plaquenil and prednisone. Eczema from milk, vomiting from milk. Asthma < house mites, cat and dog hair, < grass, with wheezing > sitting straight. Arthritis is common in the family. Her grandmother had rheumatic arthritis. Her father developed arthritis for a while after he suddenly had been left by his first wife. He was not allowed to see his children anymore. He was deeply shocked by the affair. In general she is sweet and busy. She cannot stand injustice, for instance if her little sister is being teased at school. Her disease can affect her, especially after she heard a nurse say once that she could die from it. She has a fear that other children will laugh at her because of the blue spots on her legs. She became more closed after her disease. Desire: french fries, mayonnaise, ice, banana. Food: worse from milk and cream ice. Sleep can be difficult, better when her mother is nearby. Dream: Being stabbed in her head by a man. 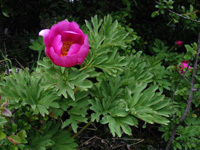 Paeonia appeared in the list of remedies. It is known for very painful hemorrhoids. I thought that to be quite similar to inflamed veins elsewhere. The aggravation time of 5 pm was also mentioned. Paeonia is a remedy thats seems to be indicated in cases where the problems start after big changes like divorce and moving. In her case it was her father who underwent the shock of a big change. The state was passed on to his children. After Paeonia MK she is doing gradually better. In the course of a year her complaints are gone. She feels more alive, is more lively and happy. Her father also takes the remedy as I suggested to him and he also feels much better. He is a man who could not stand changes.